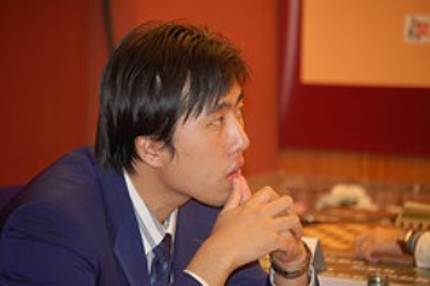 Bu Xiangzhi is a chess prodigy and was born in December 10, 1985 in Qingdao and is a chinese chess grandmaster. He learned chess when he was 6 years old and received chess tution. Aged 12 he won the Youth Championship of China and 1998 he became worldchampion category U14. He and his trainer Ji Yunqi moved to Europe in 1999 to participate in international tournaments. In 1999 he achieved the three GM norms necessary to become grandmaster within just two months, winning tournaments in Paks, Budapest and in Qingdao he came equal 1.-3. He received the title of grandmaster just 13 years, 10 months and 13 days old and became the youngest grandmaster in history at this time. In 2000 he won the Neckar-Open-Tournament in Deizisau/Germany. In 2004 he was the winner of the chinese championship in Lanzhou. In 2007 he wins the Neckar-Open in Deizisau, Germany for the second time and he wins the Canadian Open in Ottawa. 2008 he came equal first at the Gibtelecom Masters-Open in Gibraltar. Xiangzhi has a FIDE Rating of 2714 ELO (December 2008). He is ranked at number 26 worldwide and is a so-called Super Grandmaster as his rating is higher than 2700.